Do you know Santiago de Compostela cathedral ? Santiago de Compostela Cathedral is a cathedral in Galicia, Spain. The cathedral is the believed burial-place of Saint James the Greater, one of the apostles of Jesus Christ. 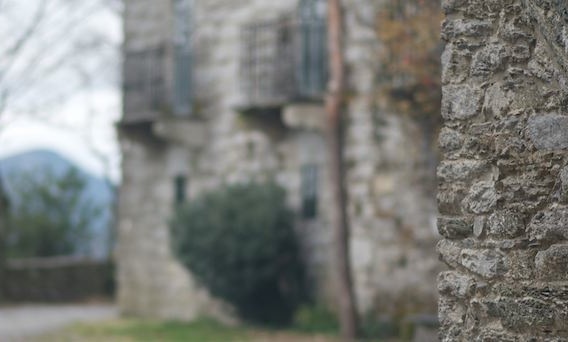 It is the destination of the Way of St. James (Camino de Santiago), a major historical pilgrimage route since the Early Middle Ages. 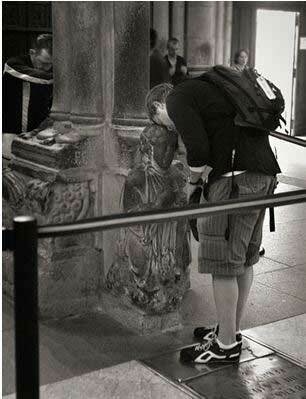 Pilgrimages to the tomb of St. James began as early as the 9th century, and by the 11th century, the cathedral was even drawing pilgrims from England. The building is a Romanesque structure – with later Gothic and Baroque additions. There is a statue of St. James at the altar, and his relics lie beneath the cathedral’s high altar in a silver coffer; they can be viewed from the crypt. In the cathedral’s Capilla del Relicario (Chapel of the Reliquary) is a gold crucifix, dated 874, containing a piece of the true Cross. Entrance to the cathedral is through the Pórtico de la Gloria, carved in 1188 by Maestro Mateo. Originally the exterior west door, it now stands just inside, behind the newer Baroque (Obradoiro) facade. 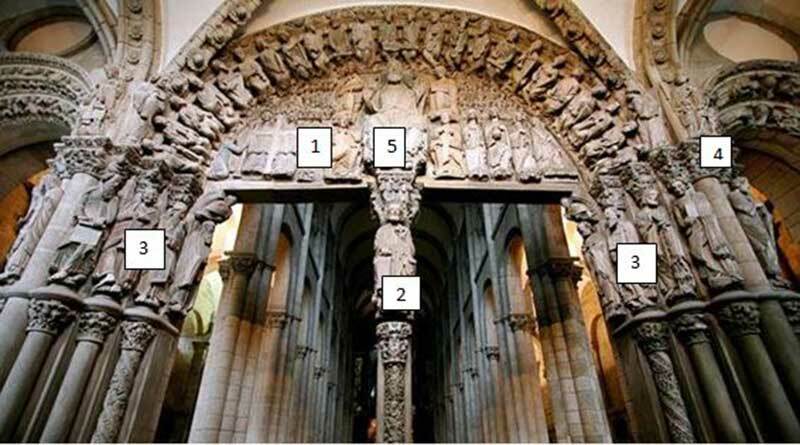 The shafts, tympana and archivolts of the three doorways are a mass of sculpture depicting the Last Judgement. Trumeau, reserved for Christ, the Virgin or important SaintsTympanum usually depicts Last Judgement scene : Christ, pantocrator , is symmetrically central, often in an oval, mandorla shape, flanked by the 4 Evangelists and the 24 Elders of the Apocalypse.Watch the following picture of the Pórtico de la Gloria and what the meaning of the images is. Pantocrator. The pantocrator is shown, with the figure of JesusChrist in Magesty, displaying in his hands and feet the wounds of crucifixion. Sculpture is a simple narrative, aimed at educating illiterate believers. Naturalism is less important than the religious content. On either side of the portal are Prophets of the Old Testament, including Daniel, who seems to be smiling. The arches over the side doors represent Purgatory and the Last Judgment, with Christ in glory presiding in the centre. He is flanked by the Four Evangelists and surrounded by the 24 Elders of the Apocalypse playing medieval musical instruments. Below the Christ figure on the central column is a statue of St. James and, at the bottom, a self-portrait of Maestro Mateo. Since the Middle Ages it has been the custom of pilgrims to pray with their fingers pressed into the roots of the Tree of Jesse below Saint James, and five deep indentations have been worn into the marble as a result. Finally, pilgrims touch foreheads with Mateo for wisdom. Praterias facade (southern side of the cathedral) is built in Romanesque style in 1103 by Master Esteban. Obradoiro facade (western side) in built in Baroque style in the 18th century and belongs to highest achievements of Baroque architecture in Spain. 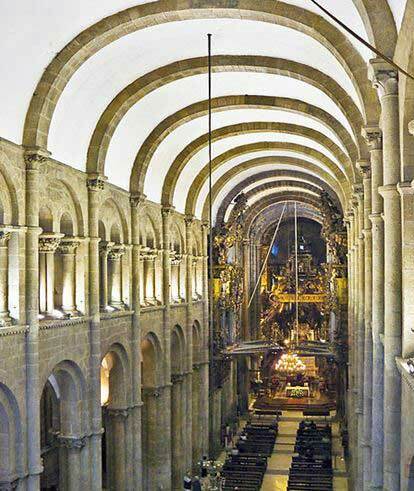 Great achievement of Romanesque architecture and art is Portal of Glory (Pórtico da Gloria), completed in 1188. It is adorned with sculptures of fantastic animals and many other sculptures, which were covered with colors. Acibecheria facade (north side) is designed in Baroque and Neo-Classical styles. 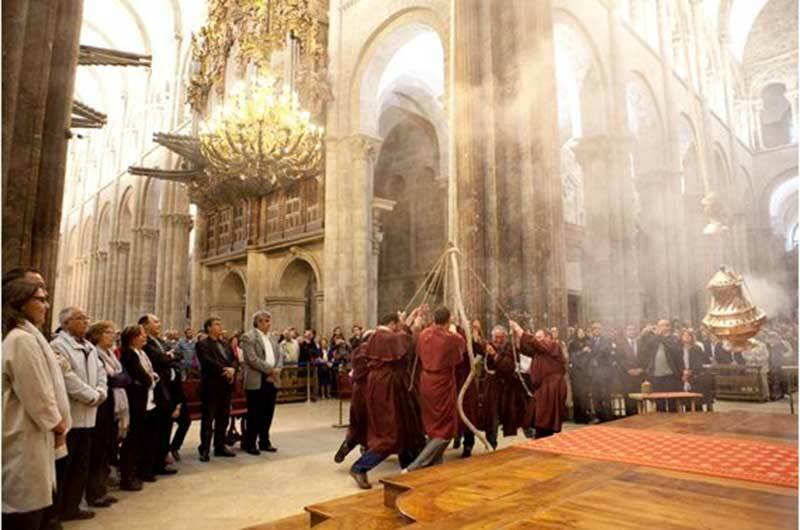 Impressive tradition of this cathedral is fast swinging thurible – ornate, 1.6 m high censer, the largest in the world. This censer is named Botafumeiro and is used in specific ceremonies. It swings with a speed up to 80 km/h, leaving trails of thick fumes. It is considered that this powerful “air freshener” was used in order to mask the stench from the crowd of pilgrims who entered the cathedral after weeks long, exhausting pilgrimage without washing. Finally, the Late Gothic cloisters are well worth a look particularly for their view of the cathedral exterior, crawling with pagodas, pawns, domes, obelisks, battlements, scallop shells and cornucopias. Underneath the cloister is the Bucheria (Archaeological Museum), housed in Mateo’s original stone choir and the remains of the 13th-century cloister. Maybe your favorite part of this cathedral has not been mentioned. I would like you to write about your first feeling in the cathedral or what you liked about it. Hello! I am trying to identify my “Head of a King”. He is Champagne coloured limestone, from the Burgundian region of France according to test results. He is wearing a very simple “crown” with Gothic/Romanesque details. Any help would be greatly appreciated, and Thank You Very Much, Robert D. Walsh, NYC My Facebook Page: Robert Walsh/Head of a King.